Sailing is a great metaphor for business. Why? For entrepreneurial success, there are profound similarities between sailboat racing and operating a business. 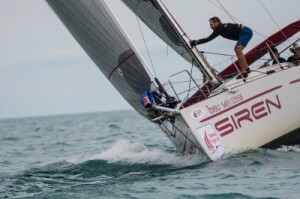 Cunning and skill are paramount to succeed in business and sailboat racing. An applicable salient concept in sailing for entrepreneurs is course correcting. A sailboat captain won’t win a race by ignoring ever-changing wind conditions. That’s doubly true when a sailboat is caught in high winds. A good sailboat captain watches the water’s currents, the clouds and wind directions. Sailboat owners know that wind conditions can change suddenly and dramatically. When conditions change, a savvy captain will react accordingly. Usually, it means tacking to change the position of the sails. So, sailing is a great metaphor for business. Entrepreneurs, of course, face turbulence, too. Among the reasons companies need a course correction are the root causes of cost overruns and failures. Management is mostly to blame because most change-management programs crash and burn. Why? It’s up to management to hire the right people, and to invest in the right tools while inspiring employees to accept and drive change. So, the right strategies are needed to make change-management programs work. Not to mince words – to be blunt – you risk failure if you stay on course without anticipating and dealing with tumult in business. You’re inundated with risks. Don’t let fear consume you. Listen, watch and think. True, few businesspeople deal with risk right the first time. For the rest of us, it’s often important to risk and tolerate failure. Failure can be humbling, but it can lead to wisdom. If you don’t change course in the face of adversity, it means you’re not keeping an open mind. Unless you see things differently with objectivity, problems start when you fail to keep an open mind. The best way to keep an open mind is to regularly use the Principle of Contrary Action. In all things, keep a mental record of how do you do things personally and in business. Then, do things differently each time – whether it’s the route you take to a grocery store or in driving to see a client. Why? Many companies are stuck – they’re drowning in the sea of mundaneness. That’s especially true when they don’t differentiate in marketing, sales and customer service. Then, they don’t make course corrections. They’re so busy looking over their shoulders worrying about cash flow and competition, they end up looking and sounding like their competitors when they should be employing new approaches. Again, it starts by keeping an open mind. As in sailing, you must be agile in this dizzying fast pace of business to sustain your growth. While you’re plodding along, competitors emerge every day. Technology and consumer attitudes are forever changing. Many people believe the purpose of a business plan is try to raise capital via angel investors or venture capitalists, or to borrow money from a bank. Actually, there are many reasons to write a business plan and to fine-tune it. The trick is to know your strengths and weaknesses, fine-tune your strategy, and act with boldness to overcome obstacles. Hence, course correcting. Even while coping with failures and seemingly overwhelming odds, it’s not the end of the race. You always have options in the wide-open sea of business – whether you need to create a new product or target a new audience. Practice continuous monitoring. You need to assess the issues, the risks, the cost-effective benefits of strategy, and your ability to act for a return on your investment. While you’re studying problems and deciding what to do about them, be alert to the need for the timing in your execution of strategy. Timing is important so you don’t risk losing your relevance in the perceptions of your customers. Don’t miss opportunities by being too reluctant to act. A successful course correction means evolves from a keen sense of your challenges and in your timing, and to act with vigor. 8 Change Management Tips for an Unpredictable Marketplace — For a business to win in an unpredictable marketplace, there are eight change-management strategies to implement. Among the key concepts to remember: Double-down on effective management. Successful Entrepreneurs Smile from 20 Practices — Successful business owners smile because they are different. They take positive approaches that help them emotionally, physically and financially. 10 Best Practices for Entrepreneurial Success — For top financial performance and the creation of jobs, there are 10 best practices for entrepreneurs. They range from innovation to monitoring your marketplace.